How strong are abolokov threads, ice screws and re-bored holes for anchors? Lots of data and strong opinions out there. Do the tests represent real world conditions? We have put together several resources for a broad view of ice protection strength. 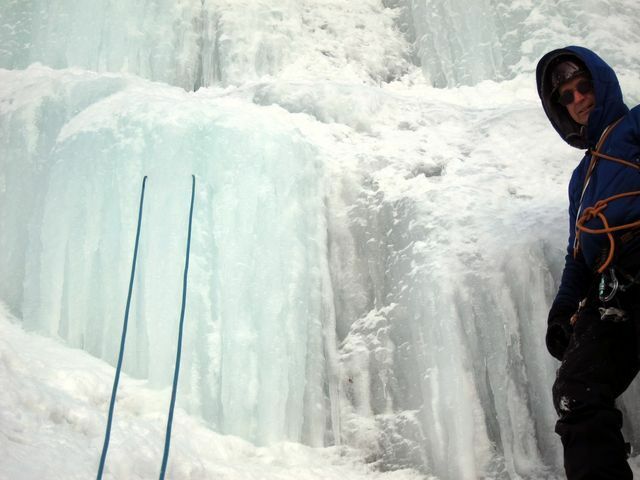 This will help us all understand how to better protect the ice we climb. Ridgerunner & Larry show us that in solid dry ice you don’t need to leave a thread, just use the rope (a thin rope). Always backup the first person down and have them give a test pull. But as per the data, the orientation should have been vertical. But would this still work? Read below and you decide. “Where to put the pro? It might be ok or even preferable to use someone elses ice screw placement to avoid pump, to be able to use that dull screw without bite, and to avoid ice fracture propagation. Recently re-bored holes in a freezing environment were found to be strong enough in most configurations. Abalakov ice anchors were also found to be strong, provided that enough ice area was enclosed by the anchor. This is accepted as a fact based on trial and few error among ice climbers, but maybe haven’t been examined in a proper experiment before. Ready to change? Placing Abalakov anchors vertically appear to be stronger than placing them horizontally. A vertical “A-thread” Abalakov was superior to a horizontal “V-thread” Abalakov. Climbers may actually have to change behaviour here. Will those results be all it takes, or do we need to hear this from authorities such as the UIAA and see it done by the elite in the glossy gear catalogs first? Anyway, a 60 degree angle seems to be the best for Abalakov V-threads. Feeling safer with a v-thread than a stubby? Don’t. A single re-bored short (8 cm) ice screw is generally about the same in strength as a horizontal Abalakov anchor. “The v-thread is a great piece of know-how to use. A few points. It is my understanding that convexities in ice are weak points, as there is increase surface tension and studies have shown that when ice anchors (threads, screws) fail, the majority of the ice that is lost causing them to fail is lost from the zone of increased tension (above, in a downward pull) and next to no loss from the zone of compression. Or consider swinging into a bulge in the ice with a tool vs swinging into a concavity. Furthermore, when possible surface ice should be removed to expose the more homogenous ice below that isn’t as exposed to temperature variation, sunlight, and snow-cover; also providing a flat surface in in which to screw. 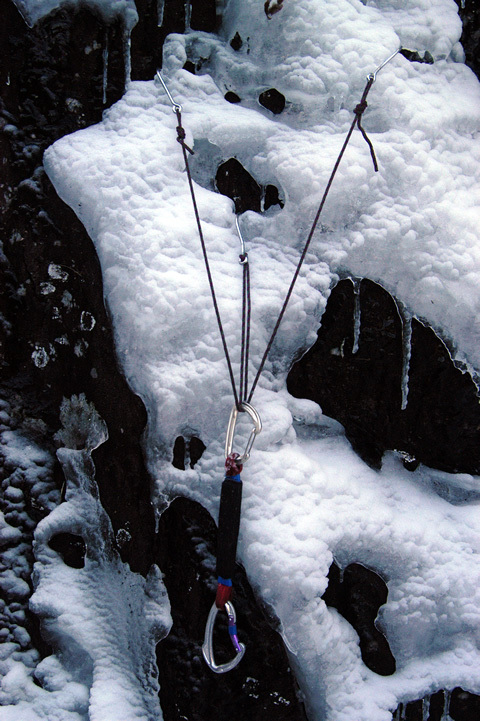 “Some time ago a study analyzing ice climbing anchor strength appeared on the internet. 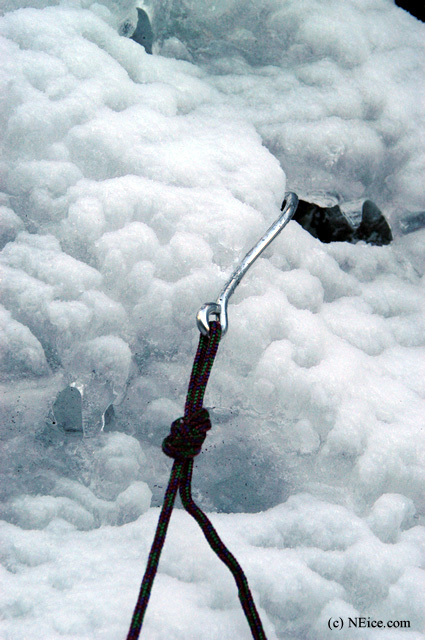 This practical field study was carried out by J.Marc Beverly and Stephen W. Attaway and was titled “Ice Climbing Anchor Strength: An In-depth Analysis”. First, on screw vs v-thread strength. I’ve seen the petzl video stuff and also seen a bunch of other testing. Most of it was done in lake ice or the “frozen slushy” ice in a bucket that used to get used for testing screws. My own experience is that many times the ice on the routes where I get scared is hollow, candled, full of air pockets, etc…I do not believe that the ice I have seen in the testing cited is comparable to the “bad areas” of ice on climbing routes that I’m referring to…so what I SHOULD have said is that a v-thread CAN BE stronger than a screw in SOME CIRCUMSTANCES. If the ice is good it probably doesn’t matter, they are both plenty strong–but if the ice is really bad, then my own non-scientific testing (i.e. placing a variety of gear in crappy ice and body-weight-testing to failure)has convinced me that the thread can often be the stronger option. Regarding concavity vs convexity–again, I am going to claim it’s circumstantial. Much of the testing done in this area is dynamic, i.e. a fall. I am a bonafide chickenshit so when I rappel from a crappy anchor (or anything in ice) I am darn sure I am not bouncing around, so I consider any force I put on the anchor a lot less dynamic. When I’ve played with weighting and bouncing around on threads in different ice, convexities like a pillar don’t seem to fracture much at all that way they might under the force of a real fall–and remember, we’re backing all of these up, right? I do. For this reason I place my threads around a convexity IF IT SEEMS APPROPRIATE simply as a matter of convenience when placing the thread, because all other things being equal I haven’t found that it makes a significant difference in real-world strength (again, tested unscientifically by placing lots of threads in various ice and bounce-testing to failure). At the end of the day though, the best place to put a screw or a thread is going to be in the best ice, and you are going to have to be the judge of that–that seems obvious but I should have mentioned it. I would encourage anyone who has read this far to go and experiment for yourself–I would argue that if you do it in a thoughtful manner you’ll learn a hell of a lot more than I or anyone else or any book or article can teach you. Now this is the ice I want to be able to protect! An early attempt for good protection on bad ice. I used Tuna hooks from the local tackle shop. Just hook the hooks into what ever you can find and equalize. I see that in the photo the cord should have been tied with a knot, similar to an equalized belay with a cordelette. The system held a surprising amount of weight. I would say “enough to slow me down”. Protection at the extreme end!